Irrigation Minister, Punjab Janmeja Singh Sekhon today made an appeal to the farminig community to use irrigation water with utmost restraint as water level in the dams was decreasing due to slow and late melting of snow in the catchments areas. In a press communiqué, Sekhon said that the snow on the high peaks was not melting at a pace as it was expected in this period of summer. He said that due to the decreasing inflow of water in the dams, the water level has been decreasing day by day. He said that the water level of Pong Dam on this date was 1299.64 feet, which is 50.22 feet less as compared to last year. He said that the water level of Bhakhra Dam was 1527.62 feet, which is 50.46 less as compared to last year. Sekhon said that the water level of the dams is decreasing by one feet every day. 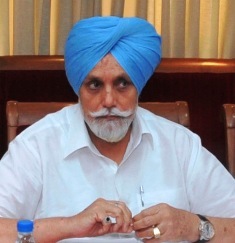 He said that if the same conditions persisted, the water in the canal would have to released on weekly basis .he said that Punjab government was committed to provide all assistance to the farmers and was ensuring eight hours power supply to the tube wells and engineers have been deputed to ensure optimum utilization of canal water for the irrigation purpose,. He said that it becomes imperative for the farmers themselves also to use the available canal water for irrigation of paddy fields with utmost discipline so that keeping in view of reduced availability of water in the canals. He said that in the beginning every pision one canal was being run weekly. Sekhon urged the farmers to use water with restraint, so that there should not be any scarcity of water in the state.